Volume's overall design strategy relates to the work Bloomberg is doing at the new hub, as well as IwamotoScott's contemporary design nested in a historical context. 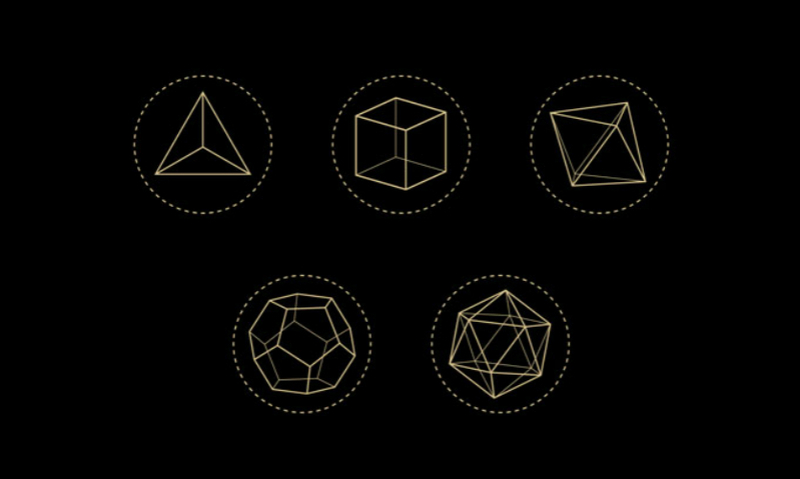 As the visual foundation for the graphics program, Volume discovered the Platonic solids, which Plato associated with the basic elements. 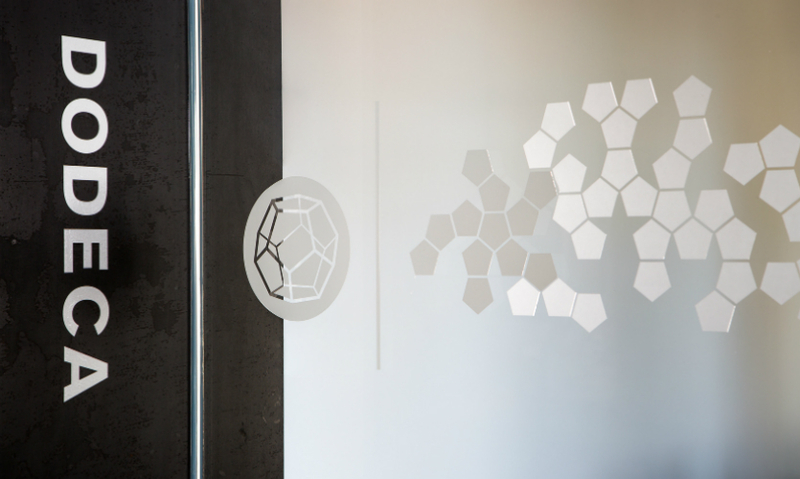 Bloomberg Tech Hub in San Francisco, by Volume, Inc.
Room names, numbers, and GPS coordinates were also applied in vinyl to door frames. In the lobby, a floor plan/regulatory sign co-exists with original floor numbering. Volume added a rich storytelling layer with interpretive panels wrapped around original concrete columns. These vignettes are silkscreened in metallic gold on aluminum panels painted to look like the blackened steel found elsewhere in the space. They tell stories about San Francisco, or about the role of science in defining possibilities. Near the lobby and pantry area, a major gathering space for employees, Volume created a friendly memo board. Volume also created a small bespoke set of symbols for regulatory signs. Small 3- by 6-in. 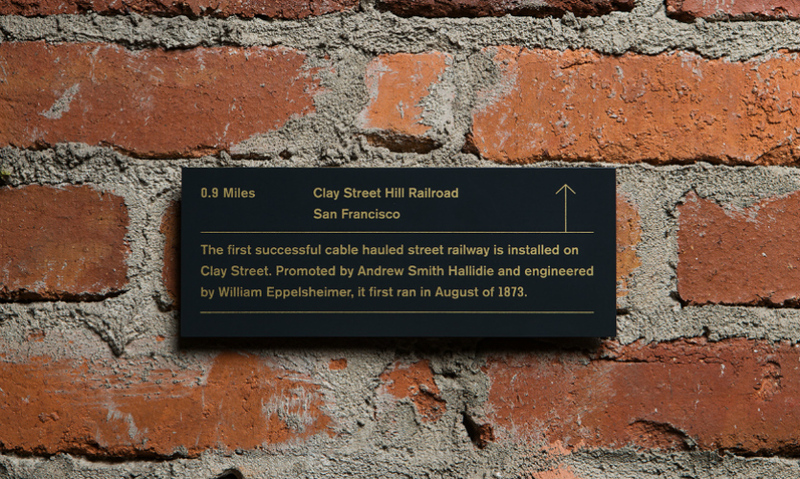 plaques tell additional stories about historic events related to innovation that happened in or near San Francisco. Bloomberg may be the new kid in town when it comes to San Francisco’s hot tech scene, but the global business and financial information and news provider is no start-up. That’s abundantly clear when you see its sophisticated new R&D offices in the South of Market (SoMA) neighborhood: no foosball tables, beer taps or Velcro walls here, thank you very much. Bloomberg commissioned architecture firm IwamotoScott to design a more mature version of the modern tech space. It occupies 20,000 sq. 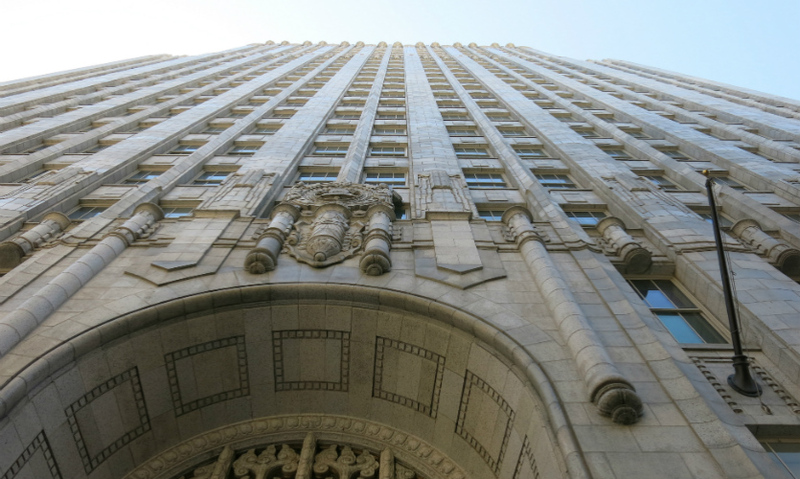 ft. on the 22nd and 23rd floors of one of San Francisco’s most beautiful and historic buildings, the Pacific Telephone Building at 140 New Montgomery Street, built in 1925 in Art Deco splendor. IwamotoScott respected its good bones, exposing the concrete and brick shell to create an elegant juxtaposition of the old and the new. 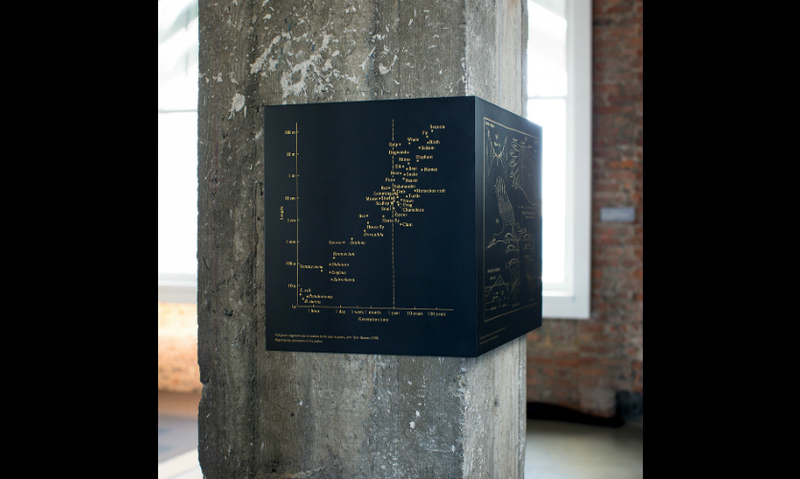 Volume Inc. (San Francisco) extended the visual narrative with graphics that honor the old/new space and articulate the relationship between technological innovation, art, and science. Magnusson chose carefully when it came to the architects and designers who would shape the space. She selected IwamotoScott as the renovation architects because of its local roots as well as what she called “their unique overlay of being deeply connected to digital production methods and the digital industry and their analog sensitivity when it comes to materiality and detail.” That plays out in the architects’ use of exposed concrete and brick, as well as woods and metals. The office also needed to integrate signature Bloomberg features such as the fish tank (whose origins are in founder Michael Bloomberg’s love of aquaria). In the case of the San Francisco office, IwamotoScott designed a rhombus-shaped aquarium for stingray that sits in the main lobby below a dramatic sculptural media element called Light Volume. 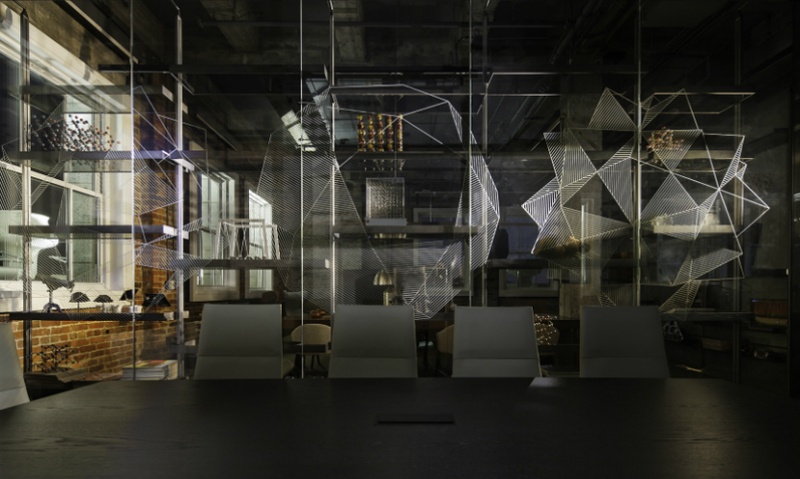 The video projection is an abstract translation of the live data feed coming from the Bloomberg Terminal, and it lines the inside of a faceted steel-plate structure that forms a void between the office’s two floors, providing important visual connectivity between the two. IwamotoScott’s architectural solution also addresses Bloomberg’s famously egalitarian use of space: sightlines are open, conference and meeting rooms are transparent, and everyone has the same workstation, regardless of rank. The space also accommodates the mobility and infrastructure needs of a high-tech workforce. 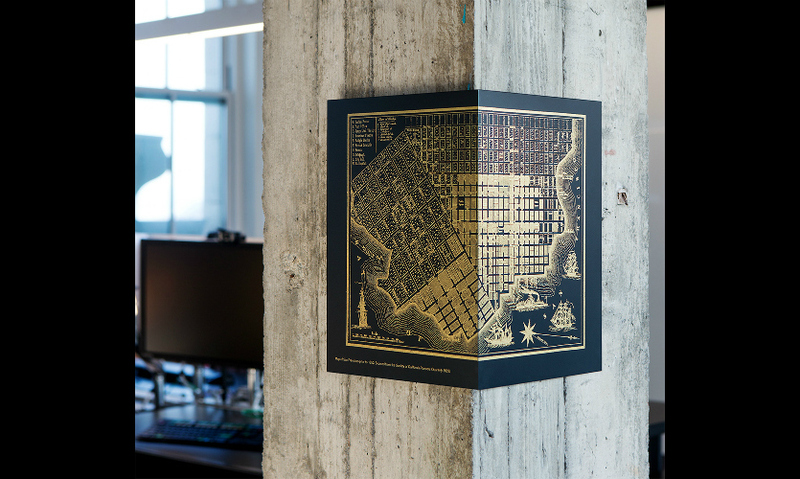 Beyond the architectural shell and infrastructure, the space also had to be uniquely of San Francisco and create a narrative about its current function. During her research, Magnusson had heard about the work of hometown firm Volume Inc., and their storytelling skills ultimately won the day. “The goal was to create an overlay of narrative and type that was going to be part of the spatial experience, not an afterthought,” explains Magnusson. Volume’s graphics not only had to co-exist with signature moments like the aquarium, but also sympathize with raw concrete pillars, brick walls, and more refined details such as a diagonal wood-beam ceiling canopy, blackened steel, and leather-wrapped door handles. 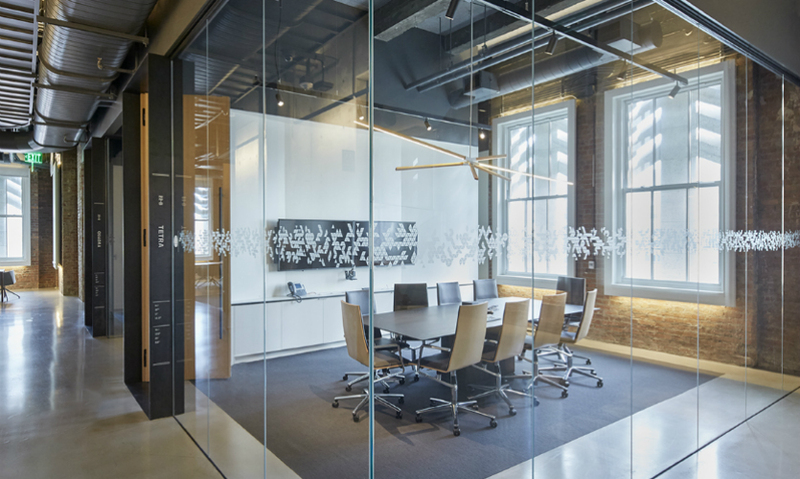 So Volume’s “light touch” includes room identification that’s integrated into blackened-steel doorframes and in distraction banding on glass meeting room doors. 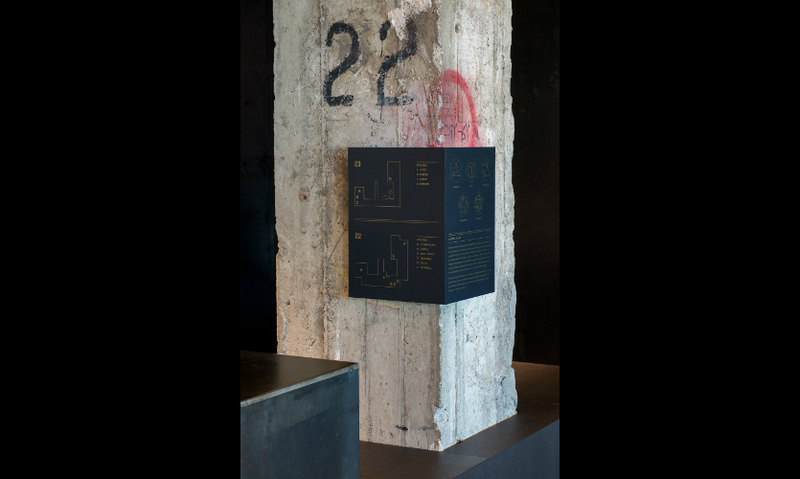 It also shows up on interpretive panels that float off brick walls and concrete columns in silkscreened painted aluminum sympathetic to the blackened steel. 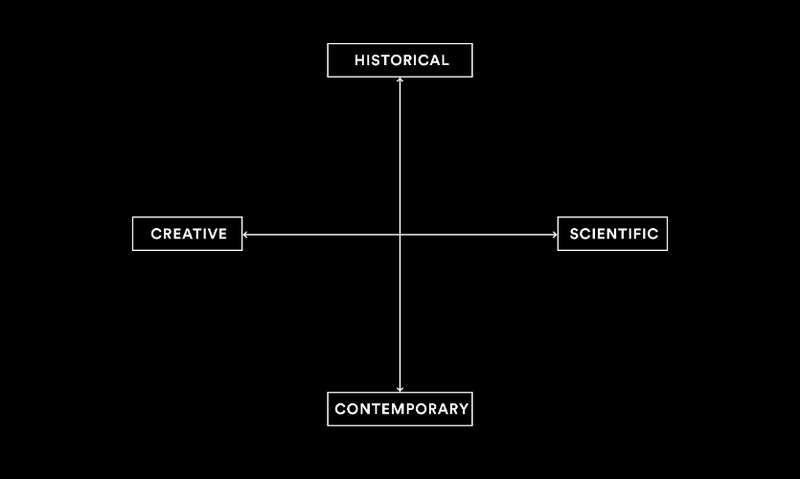 In the conceptual design phase of the project, the Volume team looked for a graphic underpinning that could help articulate the old/new/science/art scheme in tangible, visual ways. They found it in a book about the Platonic Solids, the five convex polyhedron volumes that Plato associated with the four classical elements of earth, air, water and fire. Mathematicians, astronomers and other scientists have been fascinated with Platonic Solids for centuries. The team adopted the solids as the core of a system to identify major meeting and conference room spaces. Rooms are assigned the names or shortened versions of the names of the solids (Octa, Dodeca, Deca, Cubo, etc. 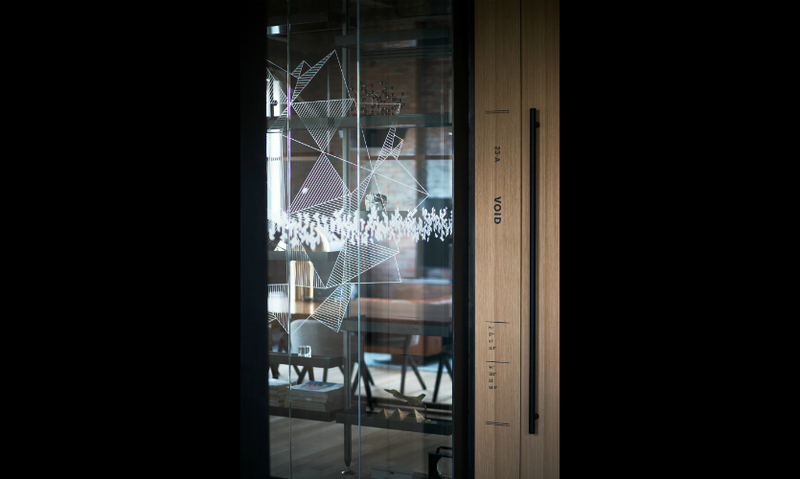 ), and the volumes are depicted on glass doors and walls in vinyl. Here’s where the “future” comes in: The solids—both whole and "unpeeled"— are represented in opaque white vinyl, and the distraction banding continues across the glass, repeating the "unpeeled" pattern in translucent vinyl with a crystallized finish, metaphorically representing "the potential of how one can use existing foundational elements to create something wholly new," says Heiman. 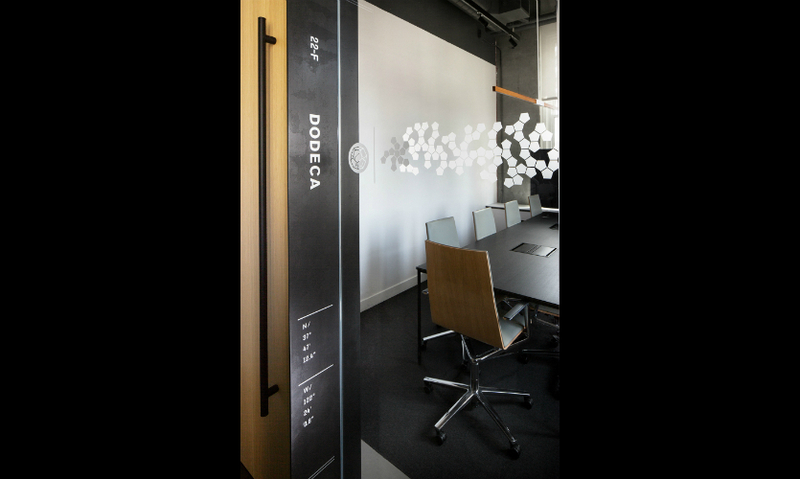 Blackened-steel doorframes carry the room names and numbers in vinyl, and in a nod to not only “localizing” the graphics but to Bloomberg’s data-centric work, the GPS coordinates for each physical room location are also shown on the doorframes. Volume applied yet another graphic stroke to concrete support columns in the space, using them to create little historic vignettes that speak to the idea of what’s happening in the space now. Another panel features a chart that maps the ratio of the size of an organism to its lifespan, while yet another depicts a bust of the Egyptian queen Nefertiti paired with a diagrammatic “recording” tracking a research subject’s eye movements as he viewed it. Supplementing the interpretive panels, small 3- by 6-in. plaques also dot the space, pointing to historic events related to innovation that happened in or nearby San Francisco. These “little surprises” are fun and informative while helping make the space unique to its location. In addition to the room identification, interpretive panels, and wayfinding elements, which is currently being installed by WeidnerCA. 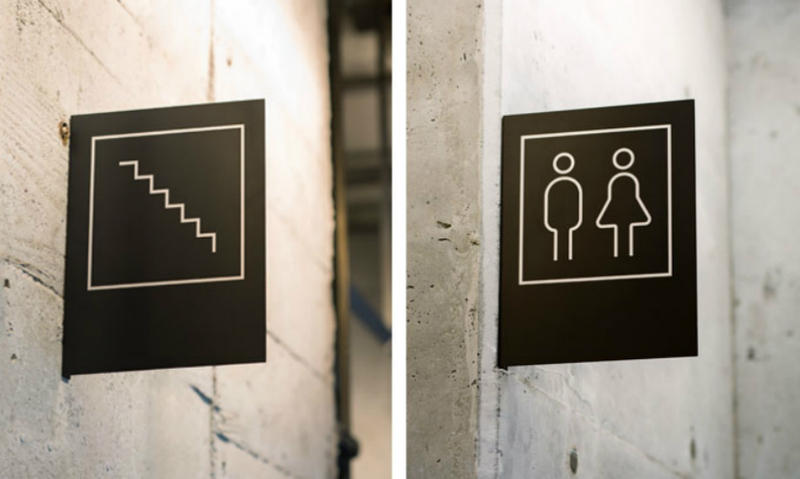 While Bloomberg gave the designers and architects license to localize the space and create a design language that is uniquely San Francisco, they also wanted to mind the brand. “They have strong brand guidelines and they wanted to make sure their brand came through,” says Heiman. Volume managed both by using Bloomberg’s corporate typeface, Akzidenz-Grotesk (which has recently been changed back to its original custom Avenir), for all text. But they commissioned typeface designer James Edmondson to create a new, custom number set exclusive to the new office. 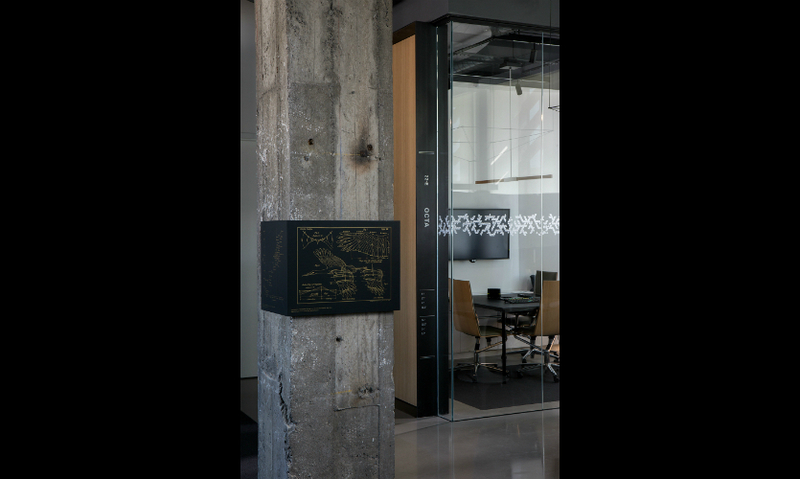 It complements some of the old numbering that IwamotoScott left on original concrete pillars and walls, as well as some original Art Deco typography found around the lobby and elevator base. Project Area: 20,000 sq. ft. 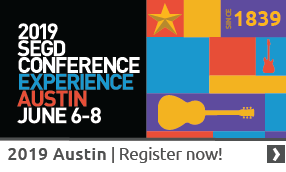 Explore more great content in your areas of interest in SEGD's Xplore Experiential Graphic Design index!